This isn't a glitch. It's W.A.I. (Working As Intended). 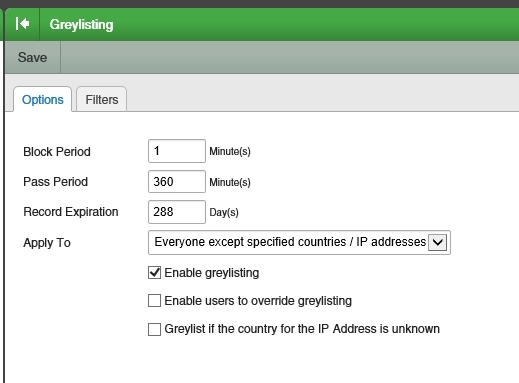 Greylisting is not just based upon the Sender Address but also on the Server IP that is attempting delivery. If a Mail Service is using Round-Robin or Elastic IPs to deliver an email then it won't pass Greylisting UNTIL delivery is reattempted from the same IP Address. Fortunately there aren't many services that use Round-Robin or Elastic IPs for email delivery. Google Mail and AmazonSES are two of the biggest exceptions. In these cases you would want to add their IP Ranges to your SECURITY > GREYLISTING > FILTERS. Over time you'll discover other rare occurrences where you may have to setup a service's IP Range in the Greylisting Filters but thankfully it doesn't happen very often. On another note Google, despite using Round-Robin will eventually pass Greylisting successfully without being added to the Greylisting Filters. It just takes a larger number of retries before delivery from the original IP Address is retried. Many thanks for the explanation. I realise now how it completely makes sense to greylist both email addresses and IP addresses. I am having the exact same problem with senders from office 365 accounts. There has to be a better way than finding IP ranges. I have really MAD not frustrated users. Can we do anything about this? By the way, I found this as well. I hate to admit that I don't even know how to add some of these ranges. 1) Once an IP address/sender has passed through greylisting any further emails from the same IP address should be accepted regardless of the sender as we have established it will retry so there is no point in delaying. 2) Have the option during the deferal to switch from a /32 match to a /24 so where a provider round robins in the same /24 it passes. This won't address where they are in different networks but would be a help. I am in the middle of adding the Exchange Online Protection IPs myself right now. It appears that there are close to 400,000 IP addresses in about 27 different CDIR ranges. After that I need to track down the Google IPs. Then possibly Yahoo and AOL, etc. 1) this should have been a prepopulation option from SmarterTools. I should at least have the ability to say, for example, allow Exchange Online Protection somewhere and not have to track all this down and enter it manually as this completely breaks Greylisting. How long do you think it will take for the mail server to pass a message when it could come from 400,000 different IPs? Longer than 4 days I would suspect. 2) Once you have added exceptions for all the big providers, where has the value of Greylisting gone? Practically into the toilet. You have now excluded the vast majority of locations you will receive mail from. This needs to be rewritten as this seems to be a very poor implementation, and it is not described by SmarterTools as working in this way. It is described as being done via the From: address, so that is how it should work. Don't say one thing and do another. FYI - As of today (9/23/2016) here are all of Microsoft's Exchange Online Protection IP addresses converted from the published CDIR to IP Ranges for easy entry into SmarterMail. I used this tool to do it quickly, in bulk. The tool can export to CSV, if there was a way to import it (HINT - HINT) [ w w w . ipconvertertools . com / cidr2ipranges ] I can't post hyperlinks, so remove the spaces. We use the Whitelist from SPF records. This is a free tool from Mighty Blue software. Thank you Matthew. This helps with the labor, and certainly is a great tool filling a current need. However, it should not be needed. The requirement to whitelist major providers at all is a fundamental flaw. Without the IP check, at least the greylisting function is there doing its job on the from address. Now that you are whitelisting the vast majority of IP addresses E-mail will realistically be coming from, greylisting is not even being performed on the majority of your inbound mail anymore. You have exempted it by creating an exception. Adding the IP check element breaks greylisting. I can't put a finer point on it. This is a classic case of adding checks decreasing security rather than enchanting it.